T. W. Dittmer's full name is Timothy Watson Dittmer. He was raised in Gary, Indiana, the son of a steel worker who turned to preaching the Gospel. After high school he joined the Army, volunteered for service in Vietnam, then reenlisted for service in Vietnam. When his time with the Army was over he studied music, digital electronics and information technology. He started writing music and poetry in high school, and has carried the love of those arts through his life. He now lives quietly with his wife in Michigan. The Five-Toed Tigress is a living legend in Cambodia and where they once roamed free and proud on the Tiger’s Dance Floor in the Cambodian forest, much of their habitat has now been stolen by man and war. Yet, deep in the forest, secreted in the ruins of ancient temples, the dens of these proud animals can still be found and they still stalk the jungle night. Author T. W. Dittmer brings us a tale that combines the mysticism of South East Asia with the harsh realities of the life of an FBI Agent in post 9/11 America. Preston Hawke is an ex-special services soldier who has left the army under a minor cloud of insubordination. When he is recruited as a possible FBI Agent, he jumps at the chance of a new career. Having finished his rigorous training at Quantico, Probationary Special Agent Hawke is sent to a small regional FBI office in the mid-west, where he will continue his assimilation into the service, under the mentorship of two women; Special Agent Deanna Tulene and Special Agent Britta Gundrum. Despite them being complete opposites in all ways, Hawke is deeply attracted to both of them. More important things await, however, as the team is caught up in a potential terrorist attack on a planned inter-faith rally that will test the new team member to his limits. Never far away, though, are the memories of Cambodia and the five-toed tigress – all, it seems, is not as it appears. I absolutely loved Five-Toed Tigress. T. W. Dittmer has managed to skilfully combine two disparate arcs across two continents into a thrilling and action-packed adventure that twists and turns in unexpected ways. The characters are the stars of the story, especially Britta Gundrum who, despite her Amazonian appearance and manner, shows a tender, loving side that was capable of melting Hawke’s heart. The story seamlessly flowed from the Cambodian jungles to the stark realities of FBI gun battles with terrorists and the political machinations of the various intelligence agencies in the United States. The author’s knowledge of his subject was apparent and his writing style flowed with such ease that a good, solid novel was easily read in a short time. The action scenes were graphic without being gratuitous, as were the minor sexual scenes. I don’t know if the author is setting this book up as the beginning of a series featuring these characters, but I do hope so as there is now so much more to look forward to as the team moves on into their new assignment. The little twists and turns the plot took were surprising and yet gratifying. It takes a lot to trick this reader, but Dittmer managed to do that in a couple of places. I can highly recommend this read to all lovers of action thrillers and military/police dramas. I look forward to reading more from this talented author. Five-Toed Tigress is a thrilling work of supernatural fiction penned by author T. W. Dittmer. Written for adults due to its highly explicit nature, this tale set in the wild lands of Southeast Asia follows the impressive female FBI Agent Gundrum and her male counterpart Preston Hawke as they explore both the mystic and the painfully real in their investigation of the forests of Cambodia. Here the fabled Five-Toed Tigress of the novel’s title reigns supreme as a figure for elegant stalking and protecting the downtrodden of the world from those who would seek to exploit them. Weaving these themes with the modern world, the tale takes on an investigative tone as the action mounts. I found the character development particularly good in this tale, though it appears less character driven and more esoteric in parts. Gundrum is a strong figure with both masculine and feminine traits which serve the story well, and Hawke presents the typical action hero one would expect to find in this kind of story. Mixing the mundane with the ethereal works well as a overall theme for the novel, which switches between the gritty realities of life, combat and danger in Southeast Asia and the mystical beliefs of the people and the spirits of the forests themselves. 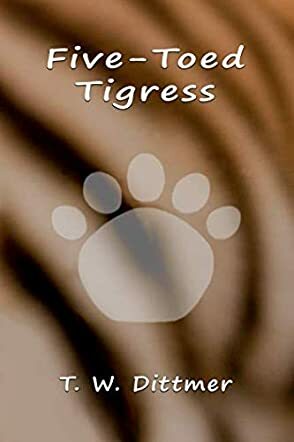 Author T. W. Dittmer presents a unique viewpoint that won’t suit all readers, but is well worth it for those who like a little supernatural flair layered over their action, and for this reason I would highly recommend reading Five-Toed Tigress. An excellent book. Five-Toed Tigress by T.W. Dittmer is an action-packed novel with supernatural elements in it to keep you on the edge of your seat. Preston Hawke is recruited into the FBI as a former special forces officer in Vietnam. While on probation, he is partnered up with the six foot six, blonde bombshell, Special Agent Britt Gundrum who brings him to his new assignment in Traverse City, Michigan. He meet his director, the beautiful Deanna Tulene, who loves to get the attention of her staff by striking seductive poses to give them glimpses of cleavage at least once a day. Mr. Dittmer does an absolute outstanding job of creating the professional atmosphere of the office, combining action with lots of laughs. His cast of characters is colorful and professional whenever the action takes place. The author lets the story tell itself with the ever-present, methodical five-toed tigress on the prowl and leaving her scent everywhere. When Interpol gets involved, a woman from Hawke's past arrives to add spice to his life. You can't have FBI agents that don't go into hostile situations, so there is plenty of action to keep you on the edge of your seat. Five-Toed Tigress fires on all cylinders, with action, bawdy flirtations and a little romance thrown in for good measure. I was entertained on all levels. This masterpiece had me from the get go and it was really tough to put down. The pages flew by with laugh out loud, bodacious humor. When it was over, I was sad the story had ended. Bravo! Encore!